Socialist Action conducted this interview with Nuunja Kahina (the pen name of an Amazigh activist) in late 2013. Imazighen (the plural form of Amazigh) are often called “Berbers.” Their language is Tamazight. The interview has been edited and shortened for publication. 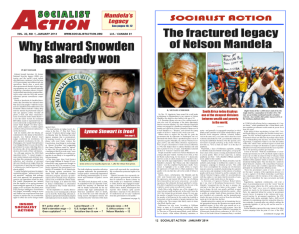 Socialist Action: What is the geographic distribution of Imazighen? Nuunja Kahina: The Amazigh lands, which are collectively known as Tamazgha, are spread from Egypt all the way to Morocco—essentially all of North Africa. But the Amazigh population was much more concentrated in some regions as compared to others simply because of how much people were affected by Arabization. Something like 60% to 70% of the Moroccan population consider themselves Imazighen. Before Arab colonialism, there were different invasions and cultural exchanges, coercive or not, which we don’t know as much about in relation to the Imazighen population. You had Romans, Greeks, Venetians, and then Vandals and others as well, who variously invaded and retreated. Roman colonialism was more formalized, certainly, and the Greeks were actually the ones who were the first ones to call us Barbere, which then led to the current term Berber, because we didn’t speak the same language. There are theories about whether or not this is degrading or not. Some say it was just a metaphor for another language, but others say it was derogatory, and that they thought we just spoke a nonsense language like bada, bada, bada, bada, bada, and then this term came about. There are still some influences from the Romans. One example of our traditional dress is essentially like a toga, and some people say that comes from Roman colonialism. During that period, a lot of Imazighen along the Mediterranean Coast were Christian. That did not come from Roman colonialism but was just something that had been present and had spread. Throughout the 7th century, there were Arab invasions and retreats; it essentially took a century for Arab armies to get all the way across North Africa because they kept being defeated and kept trying to come back. This was soon after the death of the Prophet Muhammad, when there were widespread expansions of the Islamic empire, and through all of that time there were different Amazigh groups fighting against it. But generally there was no sense of cohesion, no specific Amazigh identity. From the 7th century all the way up to the beginning of European colonialism, you had a sense that we were part of the Muslim world. I’ve seen different theories about how the process of Arab colonialism worked in North Africa. Essentially, it was very much based around the urban areas, so rural areas were somewhat protected from Arabization. Arabic language use was more religiously centered and not a default lingua franca. S.A.: What are the central struggles of the Amazigh movement? N.K. : A lot is around culture and linguistic rights—the right, for example, to have a language in schools or to have mother tongue education, which would go even farther, and it certainly depends on the country and the state of how things are. The right to have books and mass media in the language, which is really crucial for any kind of survival and development of the language. And to have holidays celebrated and recognized on some level. The idea that you should be able to be in government and also represent who you are would definitely be a goal of a lot of people, to have more opportunity for Imazighen, so that there isn’t this societal degradation stigma around your ethnicity. I think our situation is similar to a lot of indigenous struggles. In general, when I talk to people, if they’re familiar with Kurdistan and the Kurdish struggle. I use that as a kind of analogy, because it’s very similar; the fact that we’re spread out across several countries and have been fighting against Arab imperialism. The beginnings of European colonialism in North Africa started in what is now Algeria with some small French invasions and things like that and then started much more heavily across North Africa in the 19th century. European colonialism had a sort of divide-and-conquer strategy. It’s very commonly said in anti-Amazigh propaganda that Amazigh nationalism only came out of European colonialism. They say that we were treated better by the colonizers, and that this is the origin of the conflict between Amazigh and Arabs. There’s certainly some truth to that. We were certainly divided up and put into specific categories of Arab and Amazigh by European colonizers. But interestingly, it was European colonialism that increased the prestige of Arabic outside of religious circles. French colonizers who came down in the military or whatever were not going learn Tamazight. They learned Arabic, and so if you wanted to get ahead in this colonial society or get access to any of the power and privilege that could come by aiding colonizers, you had to speak Arabic. There were decolonization policies in North African countries. But decolonization meant the replacement of French colonialism with Arab colonialism, and with this hierarchy of Arab and Amazigh—and what that meant linguistically and politically. It was very soon after independence that Arabization policies were implemented. Instead of having French language education in schools and universities, you’re going to change it and make it in Arabic. This was neither successful nor a good idea politically. Part of the thing is that you don’t have anyone to teach in Arabic, right? So you have this massive importation of Arab teachers from the Middle East or from places like Egypt, which were always Arabized, being closer to the Middle East. This had a huge ideological influence as well as with the ideas of Arab culture, Arab ethnicity, Arab identity. They were teaching North African Amazigh kids about their “Arab ancestors.” So we go straight from having kids talk about “our ancestors the Gauls” from our French language education to now being told their ancestors are Arab. Amazigh kids are taught that all of our culture, history, and civilization comes from the Middle East and from the Arab world. Your religion comes from there. To be a good Muslim you should be Arab and you should speak Arabic. And simply if you want to succeed in this school, you have to speak Arabic or French, because Arabization didn’t actually eliminate French from the sphere, it simply added in Arabic as a very prominent factor. S.A.: What is the state of Amazigh culture and political activism today? N.K. : There’s been what a lot people have called a cultural renaissance. And for example, throughout the 1970s and ’80s, there was a lot of very militant activism. Kabylia [the mountainous region of northern Algeria] has always had a long history of militant activism, specifically throughout the Black Spring and the Amazigh Spring. As political spheres have loosened to some extent in the last two decades, it’s allowed Imazighen to express their culture more. And to begin this real process of cultural and political activism is that if you’re entirely disenfranchised and you can’t even speak your language for fear of violent attacks, it’s a very difficult for you to actually get anywhere with your activism. And now that has certainly changed. So you have Imazighen in various positions in governments. Certainly, the death of Hassan II in Morocco [in 1999] opened up a new time for Imazighen activism. The Hassan II regime was known for being particularly brutal and in large part against any kind of form of Imazighen expression. So you have now some forms of media—very limited but it is there, and you have more Imazighen music, which is kind of taking off. You have the very first beginnings of books being published and there are kids’ books. You have a few textbooks, which are very good, but it’s the very first round of things, and hopefully it will only take off from there. You have people openly waving the Amazigh flag. At any kind of rally or march you see so many Amazigh flags—which is such an important expression of cultural identity and of saying who we are as North Africans. S.A.: How do Amazigh activists relate to socialism as a goal? N.K. : I think the legacy of “Arab socialism” and Nasserism have definitely led to some anti-socialist tendencies within the Amazigh population, because it was ethnically oppressive. In Algeria, for example, you have had a formally “socialist” state, which was very repressive to the indigenous population and which practiced a form of selective development that I would otherwise associate with capitalism. To many people, Islamism is at least anti-imperial. They know that Western globalization affects them in a negative way, and Islamism is seen as a solution, as a resistance to that. “Socialism didn’t work” is the idea, so we’re going to go with Islamism, because it provides another path. I disagree with that, but it’s not an uncommon belief. Photo: Demonstrators carry Amazigh flags. February 24, 2014 in Africa, International, Middle East.